The FW-200 was a low-wing, four-engine monoplane with fully retractable undercarriage originally designed as a passenger aircraft with seating accommodations for twenty-six passengers. It was an all-metal aircraft except for fabric-covered control surfaces. During World War Two the German need for a long-range maritime reconnaissance/strike craft modified it’s role. The FW-200 carried bombs under the wings, had a lengthened ventral gondola providing for gun positions, with a 20 mm cannon firing forward and a machine gun firing aft; there were also two dorsal machine gun positions. In 1943-1944 several Condors were modified to carry two Hs-293 guided missiles for attacking shipping. No successes were recorded for Condors using this weapon. These aircraft had strengthened fuselages and were fitted with FuG 200 surface search radar. Even with the strengthened fuselage they were prone to breaking their backs on hard landings or simply coming apart in the air. Significant modifications were made to the design during the limited production run, primarily with updated engines. By mid-1944 the Condors were withdrawn from maritime services because the Allies overran their bases in France and because of fuel shortages. The surviving FW-200s were then employed as transports. This is a full box, let there be no doubt of that. The box measures 23.5 inches by 13.5 inches by 2.75 inches and weighs in at 3.5 pounds. We have two full sized sheets of Vac parts on heavy polystyrene sheet that include the fuselage pieces, the wings and the main spars. 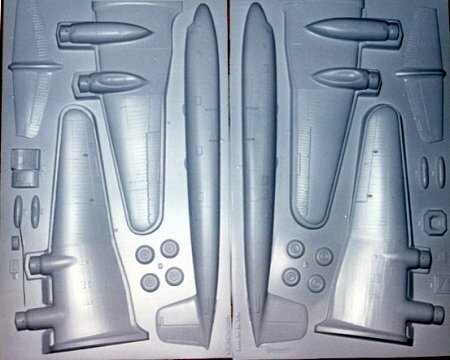 Two half-size sheets that include a variety of interior bulkheads, stabilizer and other detail pieces and two small sheets that cover the Hs-293 guided missiles. There is a nice sheet of Vac clear parts and several bags full of resin and metal goodies. The Vac parts all show crisp detail with mostly recessed panel lines and a few raised lines in appropriate areas. The panel lines on the clear parts are a little vague in spots which is something I’ve found to be common on Koster kits. There are three, count them, three bags of resin parts carefully packed into central areas of the box. The resin parts all look very nice for level of detail and display very fine levels of flash. One engine cowling has a casting imperfection in it, one control column is broken and the piece seems to be missing. The propellers all have a high degree of flash but nothing th at cannot be dealt with. The pilot and copilot seats show excellent detail as does the engine facing and instrument panel. There is one bag of white metal pieces included, which covers the landing gear, FuG 200 surface search radar mounts, and a few other odd areas. 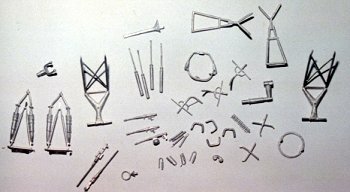 The metal is very soft and a few pieces feel like they would not take a lot to break apart. Overall we have 63 resin pieces, 40 white metal pieces, six white sheets of polystyrene containing 102 vacuformed pieces and one clear polystyrene sheet containing 18 pieces. Finally there is one sheet of brass parts totaling 119 pieces. WOW, that’s 342 pieces (not the same count as on the box art but that is what I have)! Also included is a large black and white picture of the Condor that appears to have been intended as the box art. The instructions are two large sheets, front and back that include one side in color for painting and decal placement with some useful tips for the first time Vacuform builder. I think that these could have been expanded a little. 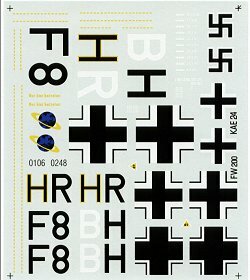 The decal sheet includes markings for 2 aircraft and appears to have good registry and density. Talk about getting some bang for your buck! This is definitely the king of Vacuformed kits. 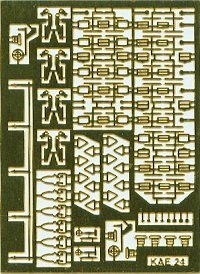 There are a few minor problems to be dealt with such as the casting defects in the engine nacelles and the broken control column but nothing that a competent modeler couldn’t take care of. 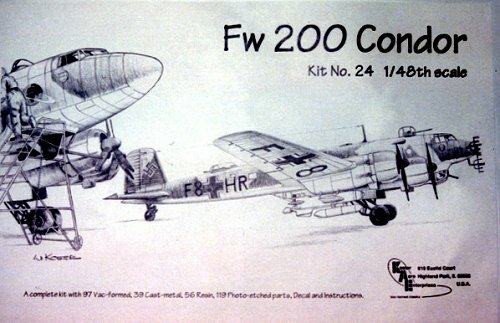 If you are not afraid to take on a project of this magnitude I highly recommend this kit to the experienced modeler. My last 4-engine 1/48 scale kit took nine months to complete, let’s see how long this will take. Stay tuned for a complete construction article. Now, where did I put that scalpel….